Be prepared for your tummy to rumble, as the best dining destinations in the world have been served up by luxury private jet title Elite Traveler. Following a sixth annual poll of its readers, the top spot has been presented to Azurmendi, a Spanish restaurant which nestles in the magical Basque countryside, which draws on the local area for its produce and inspiration. The U.S. scored five eateries in the top ten, with Per Se, Le Bernardin, and Eleven Madison Park flying the flag for New York. Meanwhile, Heston Blumenthal's The Fat Duck was revealed as the UK's highest entry at number ten. Azurmendi has overtaken Grant Achatz's 'New American-inspired' Alinea in Chicago, which had held the top spot for the past five years. 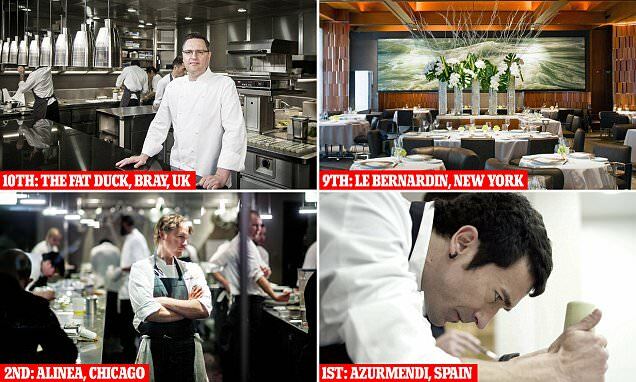 America has been recognised as the best performing country in the world with 24 restaurants making the list.